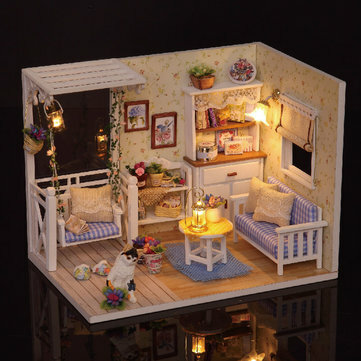 Brand: CuteRoom Item: Caribbean - DIY Dollhouse Kit Item NO. : A-037-A Light & Music Motor: Included Dust-proof Cover: Not Included Assembled Dollhouse: About 30x23x22cm Weight: About 1.9kg Note: It is NOT a pre-assembled dollhouse. You need to assemble by yourself. It requires your patience. Package Included: 1 x DIY Dollhouse Kit. Brand: CuteRoom Item: Music Motor Type: Accessories Size: About 5x4x2 cm (L*W*H) Usage: for CuteRoom DIY Dollhouse (Except Dollhouse H013, H015, H016, Together Around Series) Package Included: 1 X Music Motor (With Screws).